The Fifty Best held a “blind” tasting of 10 recent release New Zealand Sauvignon Blancs and Pinot Noirs with 12 members of our wine judging panel. Strict tasting rules were applied. The order of service was established beforehand by lottery. 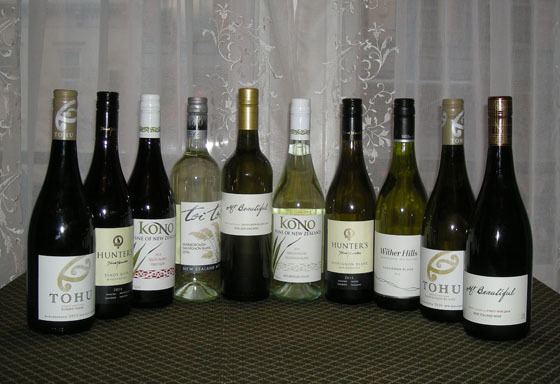 The Sauvignon Blanc and Pinot Noir were served and tasted separately as groups. Each of the wines were poured into fresh wine glasses from new sealed bottles and served chilled. Only ice water and white peasant bread were available to cleanse the palate. Grapes for this wine were harvested in the cool of the early morning, then destemmed, crushed and lightly pressed into stainless steel tanks. Fermentation was conducted with selected yeast strains. The wine was aged in the tanks on its lees (wasted yeast) for 3 months before bottling. Aroma: Peach, white peach, apricot, pineapple, green apple, grapefruit, citrus, bright floral, grassy, mineral, earthy. Palate: Green apple, apple stem, melon, lemon, lime, grapefruit, tangy citrus, grapefruit rind, mineral, chalk. Finish: Peach, apricot, melon, pear, lemon peel, crisp, tart, well-balanced. Grapes used to produce this wine were carefully selected from the producer's Atwere Valley vineyard. After cool fermentation and aging in stainless steel tanks, the wine was blended and filtered (without fining) before bottling. Aroma: Apple, light green apple skin, melon, bitter melon, honeydew, apricot, peach, grapefruit, citrus attack, lemon, lemon zest, perfumed, floral, grassy, minerality. Palate: Grapefruit, dark grapefruit pith, green apple, melon, pineapple, star fruit, pear, peach, citrus, herbal, grassy, acidic, minerality, smooth. Finish: Lemon, lemon peel, citrus, white grapefruit pith, stone fruit, semi-sweet melon, tart, well-balanced, mellow. This wine was produced from grapes harvested in the cool of the morning, destemmed and gently pressed in stainless tanks. Cool-temperature fermentation was followed by cold stabilization before bottling. Aroma: Asian pear, pear, apple, grapefruit, melon, apricot, strawberry, dragon fruit, lychee, dried fruit, flowers, herbaceous, grass, mint, musky, very aromatic. Palate: Pear, Asian pear, green apple, citrus, red grapefruit, yellow grapefruit, pomelo, melon, lychee martini, dried fruit, honey, tart, mineral, complex, high acidity, pronounced. Finish: Green apple, pear, citrus, lemon pucker, sour grapefruit pith, herbal, tart, crisp. To make this wine, grapes harvested from individual vineyards were kept separated throughout the winemaking process which consisted of cool fermentation and aging on its lees (wasted yeast). Following racking, the various lots were blended and filtered prior to bottling. Aroma: Apple, green apple, yellow grapefruit, unpeeled orange, citrus, lime peel, watermelon rind, cut grass, less herbaceous (grassy), mineral, leather, musty, earthy. Palate: Green apple, sour apple, tart grapefruit, juicy lime, white peach, dragon fruit, honeysuckle, slightly creamy, nice minerality. Finish: White peach, stone fruit apple, tart lime, honeysuckle, grassy, mineral, stone, soft. For this wine, machine-harvested grapes were fermented in stainless-steel tanks using selected yeast cultures, followed by blending and filtering (without fining) before bottling. Aroma: Bartlett pear, peach, sweet grapefruit, pink grapefruit, gooseberry, banana, melon, watermelon, slightly tropical, honey, green pepper, cut grass, wet grass, less herbaceous (grassy), earthy, leathery. Palate: Ruby red grapefruit, grapefruit, lime, citrus, sour melon, honeydew rind, peach, green apple, grassy, green pepper, vegetal, mineral, slightly tart. Finish: Grapefruit, pear, lemon peel, grassy, green pepper, mineral, slightly tart, crisp acidity, light summer wine. Because of warm weather, the grapes for this wine were harvested two weeks earlier than usual. Fermentation was conducted using a variety of neutral and aromatic yeasts, with separate lots aged on their lees (wasted yeast) for 8 months prior to bottling. Aroma: Apple, lemon, pineapple, apricot, pomegranate, Asian plum wine, light floral, dandelion, grassy, barnyard, dusty, earthy, wet wood, complex. Palate: Green apple, sour apple, melon, lychee, grapefruit, citrus, citrus pith, herbaceous, green pepper, grassy, tart, acidic, mouth-puckering, mineral, creamy, oak. Finish: Green apple, melon, green pepper, slight peppery, white pepper, mineral, consistent and pronounced. Handpicked grapes for this wine were fermented in small volume open-top fermenters with selected yeast for most of the small batches, with the remainder fermented with natural yeast. Following fermentation, the wine was aged in a combination of old and new French barriques, which was followed by blending of the various lots, and fining and filtering before bottling. Aroma: Ripe red cherries, black cherry, dried cherry, plums, cherry cola, raspberry, cranberry, pomegranate, baking spice, clove, cinnamon, wet leather. Palate: Dark cherry, black cherry, red cherry, cranberry, red currant, tart plums, citrus, tartness heavy spices, cinnamon, light oak, high acidity. Finish: Apple skin, unripe plum, green pepper, cinnamon, earthy, tart, soft tannins, mellow, balanced. Some grapes for this wine were hand-picked and fermented in small open vats, with others machine-harvested and fermented in stainless steel tanks. Following fermentation, some of the wine was aged in new oak with the remainder aged in one-to-two year-old French oak barriques. After 10 months of aging, the lots were blended, fined and filtered before bottling. Aroma: Plum, black cherry, blackberry, raspberry, raspberry coulis, dark currant, bright apples, banana, vanilla, floral, cinnamon, musty, earthy, slightly woody, oak. Palate: Cherry, dried cherry, sour black cherry, raspberry, unripened blackberries, plum, pear, pepper, baking spices, clove, tobacco, mineral, earthy, woodsy, soft tannins, good balance of fruit and tannins. Finish: Cherry, dried apples, floral, spice, balanced, well-rounded. The grapes for this wine were hand-picked and fermented, with each lot kept separate. Following fermentation, the wine was aged for 10 months in French oak barrels (25% new) and blended and fined before bottling. Aroma: Black cherry, dark cherry, candied cherries, dried cherry, strawberry, raspberry, black currant, stewed prunes, cinnamon, café au lait, mineral, musty, smoke, wood. Palate: Black plum, dark cherry, cherry, raspberry, blueberry, deep teaberry, burnt pineapple, cherry cola, chocolate, coffee grounds, mushroom, rosemary, spicy, black pepper, tobacco, light oak, earthy, smoke, soft tannins, juicy, nicely balanced. Finish: Berries, mushroom, mineral, slight spice, pepper, coffee grounds, woody, soft, mellow, flavorful, a manly pinot noir. Grapes for this wine were hand-picked according to clone and block, then gently destemmed, lightly crushed and fermented in open-top containers, with most parcels inoculated with slected yeasts and a small percentage left to undergo fermentation using indigenous yeasts. Following barel aging, the lots were blended and the wine was filtered before bottling. Aroma: Cherry, black cherry, dark berries, raspberry, cranberry, pomegranate, red currant, orange peel, dried fruit, sangria, port wine, caramel, nutmeg, clove, peppery, coffee grounds, wet leather, bright. Palate: Dark cherry, cherry, dried sour cherry, red currant, pomegranate, red plum, plummy, juicy, clove, nutmeg, cinnamon, tobacco, tannic, smoke, woody, oak. Finish: Raspberry, juicy, cherry, mushroom, forest floor, dusty, light smoke, tart, medium acidity, soft tannins.